The outstanding Golf Barrière de Deauville is located on site at this comprehensive holiday destination - visitors will enjoy 27 holes at what is undoubtedly one of France's finest courses. The 18-hole championship course is the most recognised golfing symbol of Golf Barrière de Deauville, and is comprised of the Red and White Courses, formulated in 1931 by Tom Simpson. With views over the stunning Normandy coastline and the Vallée du Pays d'Auge, Simpson's creation is famed not only for its spectacular setting, but also for its lightning fast putting surfaces. At 6,508 yards, it is certainly not particularly by modern standards, but considerable guile a deft touch are required to conquer this superb championship track. The legendary Sir Henry Cotton added to the existing 18 holes with the Blue Course, which may not be a full round, but is certainly a fascinating and challenging proposition. 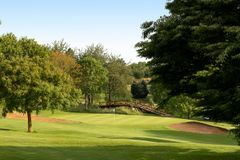 Winding through the classic Norman countryside, Cotton's creation adds much to the diversity and choice on offer at Golf Barrière de Deauville, and is well worth playing during your next golf holiday in the popular coastal region. Untidy around the course generally, greens slow all toilets on course closed. Bunkers were all compacted not sure if it was mud or sand. Club house closes at 6pm. Wouldn’t recccomend. Shame because hotel is nice.